When U2 (click here for my playlist at DrRock.com) formed as a band in 1976 in Dublin, all of the four members were still in their mid-teens and three (Bono, The Edge and Larry Mullen) were practicing Christians. A short five years later, they released their second album on October 12, 1981. Appropriately titled October, it was less a progression forward than a reaffirmation of the booming rockers that marked their debut LP, Boy in 1980. More so than Boy, October’s lyrics tended toward religious themes and subjects (“Gloria,” “Tomorrow” and “With A Shout” in particular). In early 1981, Adam Clayton was the only U2 member who didn’t join a certain Christian group in Dublin. The experience led the other three to question the inevitable conflict between their religious beliefs and their growing rock n’ roll stardom. And they used that effectively on October, for combining religious statements with their signature sound placed them in a totally different realm than those of their early 80s punk-rock and synth-pop contemporaries. 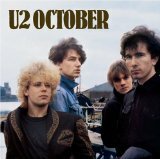 However, October didn’t sell well and is rarely counted among U2’s better albums. Nevertheless, it’s a good predecessor to their third studio album, War (1983), which launched U2 on the trajectory that made them global megastars by the end of the decade. October is available on Amazon (as a CD) and iTunes (as track downloads).